Browsing the archives for the Palin tag. Would you use the word terrorist there? [BRIAN WILLIAMS]: Is an abortion clinic bomber a terrorist, under this definition, governor? PALIN: (Sigh). There’s no question that Bill Ayers via his own admittance was one who sought to destroy our U.S. Capitol and our Pentagon. That is a domestic terrorist. There’s no question there. Now, others who would want to engage in harming innocent Americans or facilities that uh, it would be unacceptable. I don’t know if you’re going to use the word terrorist there. Violence against abortion providers, fig. 1, based on NAF data. What kind of views does Palin’s take spring from? How widespread has the anti-abortion strand of domestic terrorism been? Are there any trends? My advice is ignore the critics who know far less about Palin than she does about foreign policy. A good example is Ken Adelman, who headed the arms control agency in the Reagan administration. Adelman recently endorsed Obama and said he “would not have hired [Palin] for even a mid-level post in the arms control agency.” Well, I know both Palin and Adelman. And Ken, I’m sorry to tell you, but I think there are an awful lot of jobs in Washington that Palin would get before you. Sarah Palin’s chafin’ all right. Four Republicans close to Palin said she has decided increasingly to disregard the advice of the former Bush aides tasked to handle her, creating occasionally tense situations as she travels the country with them. Those Palin supporters, inside the campaign and out, said Palin blames her handlers for a botched rollout and a tarnished public image — even as others in McCain’s camp blame the pick of the relatively inexperienced Alaska governor, and her public performance, for McCain’s decline. “She’s lost confidence in most of the people on the plane,” said a senior Republican who speaks to Palin, referring to her campaign jet. He said Palin had begun to “go rogue” in some of her public pronouncements and decisions. “I think she’d like to go more rogue,” he said. *** The Colin Powell floodgates: Three semi-notable Republicans came out for Obama yesterday, including two former very-moderate Republican governors: Arne Carlson of Minnesota and Bill Weld of Massachusetts. Neither is that surprising to those that know the politics of the two ex-governors, but to a layman’s eyes, it’s not good news for McCain. What is striking here is that these endorsements underscore how McCain somehow lost his moderate identity — even among Republicans who seem to know him well. Seriously, these are the type of Republicans the McCain of 2000 would have counted on as his base. How did McCain end up being the nominee that was overly focused on wooing the base? How did he lose this middle-of-the-road mojo? Forget the Bush issue and the economy; McCain’s inability to keep his moderate identity might be the biggest mistake bungle of the campaign. I agree that this is a central problem with the McCain campaign. McCain got the nomination in part because he was able to convince two very different groups — the religious conservatives and the moderates — that he was their guy. The moderates had loved him since 2000, and were happy to finally have a chance to brush past the Bush machine and get McCain elected. The religious conservatives were skeptical but they didn’t have that many options — there was a deep distrust of the Mormon Mitt Romney, and Mike Huckabee didn’t seem to be a serious contender (though I think it’s significant that he received as many votes as he did). Divorced, cross-dressing, gay-friendly Rudolph Giuliani of New York City was an even worse choice for this group than McCain. So they were brought along, grudgingly. And the grudge showed. A couple of weeks ago, in a post about how the McCain campaign was sequestering Sarah Palin from the media, I wondered, “Is there a point at which she will finally chafe at the treatment she is getting from the campaign? COLORADO SPRINGS — These days, Gov. Sarah Palin seems like a candidate trying to wriggle free of her handlers. On Sunday night, she twice took questions from reporters, the first time on an airport tarmac without her press staff’s knowledge. After landing in Colorado Springs late Sunday, Ms. Palin marched over to a local television crew and began answering questions on camera, sending the traveling press corps sprinting in pursuit, and her press staff scrambling. I think something interesting is happening here, that will perhaps have a bearing on whether the McCain campaign can pull significantly closer to Obama in these last two weeks of the campaign. I think that Sarah Palin considers her running mate to be a loser, and that if she were at the top of the ticket (and making the decisions), she’d be winning. On Sunday night, she criticized the Republican National Committee’s use of robocalls. I think Palin’s frustrated that her big debut is being stepped on by the wrinkly old white-haired dude and his ineffectual group of cronies. She considers herself the star — and why wouldn’t she? There have been widespread reports of people leaving McCain/ Palin events when she’s done and the supposed headliner takes the mic. I think she has abundant self-regard and is pleased but isn’t particularly surprised at the adoration she receives at rallies. Yet the wrinkly old white-haired dude and his cronies tell her to keep reading from the teleprompter with maximum spirit (“we’ve got spirit, yes we do!”) and otherwise stay in the background while they take care of the real business of winning an election. If that possibility seems less and less likely — if Palin sees her chance of becoming vice president fade — will she become more of a free agent? Break free from her handlers in ways large and small, and try to further her own career — even if that means doing direct damage to John McCain’s chances in these last two weeks before election day? To his credit, yesterday John McCain tried to do some damage control and express opposition to some of the more out-there ideas expressed by his supporters. 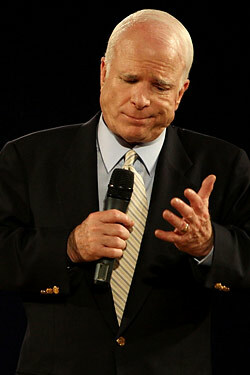 Josh Marshall asks his readers for their take on McCain’s body language in those clips. What I see is someone who is bothered on two fronts — one, with the substance of what is being said, and two, with the idea that this is now his base. McCain has long cultivated two distinct groups, sometimes doing a better job of convincing one or the other that he is one of them. American writer and satirist H. L. Mencken wrote “The demagogue is one who preaches doctrines he knows to be untrue to men he knows to be idiots.” Patricia Roberts-Miller in her book “Democracy, Demagoguery, and Critical Rhetoric” defined demagoguery as “polarizing propaganda that motivates members of an ingroup to hate and scapegoat some outgroup(s), largely by promising certainty, stability, and what Erich Fromm famously called ‘an escape from freedom’.” Hilter was a infamous demagogue, blaming the woes of a post WWI Germany on the Jews. Joe McCarthy looked for Communists around every corner. Today, the American financial system is in its worse crisis since the Great Depression, Americans are facing uncertainty in employment, prices are rising and savings are falling. The time is right for the rise of the Demagogues. Why did John McCain choose Sarah Palin to be his vice president? Evidence seems to indicate that he wanted to stomp on Obama’s convention bounce and buzz (timing the announcement for the morning after Obama’s acceptance speech), and get some razzle-dazzle for his own campaign. The actions he’s taken since then seem to show a singular lack of respect for the person he has chosen to serve as his closest advisor. She’s been aggressively packaged. We know that Palin’s convention speech was largely written before she was even chosen. We know that she willingly mouthed false statements (written for her by the McCain campaign) about the Bridge to Nowhere — and that she continued to do so long after the lie was exposed. Andrew Sullivan points out the differences between the Palin we saw at the debate, droppin’ those g’s and aw-shucksin’ her way through, doggone it, with the relatively lucid Palin of 2006. Campbell Brown’s rant centered on the astounding lack of media access to the vice presidential candidate. Palin has still not held a single press conference, more than a month after her selection and with a month left to go in this campaign. What does that say about McCain’s respect for her abilities? Then yesterday she revealed that she hadn’t actually been informed about the McCain campaign’s decision to drop out of Michigan. This was a really big decision. And she didn’t even know about it, much less participate in it. It’s one thing to not ask her advice — I’d find that telling (I can’t imagine Joe Biden being completely left out of the loop on such a major decision, for example) but an argument could be made that campaign decision-making is different than decision-making once in office. It’s another thing to just not even bother to let her know. The question is begged — is she there to contribute in any substantial way to the campaign? Or is she there to simper and wink and send “little starbursts” to the likes of Rich Lowry? Is there a point at which she will finally chafe at the treatment she is getting from the campaign? Or is she just fine with being sequestered from the media and treated like a delicate flower? Will Sarah Palin Be On the Ticket November 4th? The chorus is growing. Conservatives like Kathleen Parker are urging Palin to drop out. And more and more people think it’s actually gonna happen; “I don’t think she’ll be on the ticket in November,” Andrew Sullivan said today. But she currently has no viable excuses. Her baby had Down Syndrome when she said yes. Her daughter was pregnant when she said yes. She had five children when she said yes. If she said yes then, why would she say no now? Possible answers include a) because she couldn’t handle it, b) because she isn’t qualified after all, and/or c) because McCain made a baaaad decision.